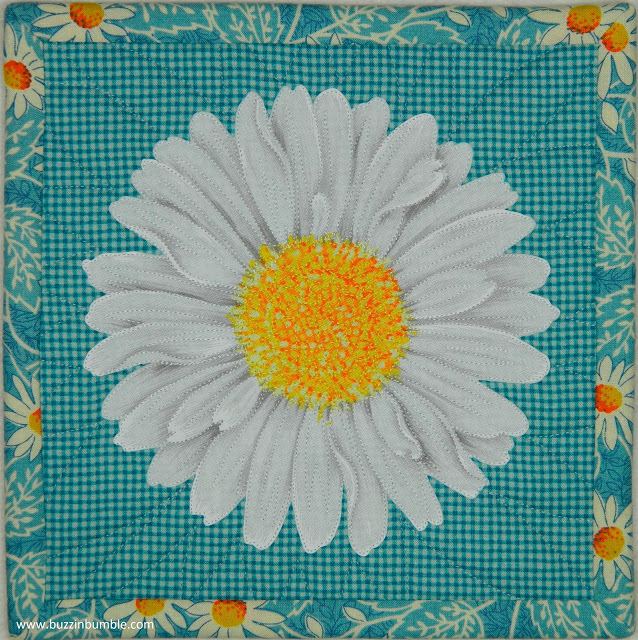 Happy Quilting: Crafted Applique Blog Hop!! Today I am super excited to share with you a fantastic new book all about a truly innovative way to do applique!!! The new technique is called Crafted Applique and it is so fun!!! The brilliant mind behind Crafted Applique - New Possibilities is Lara Bucella, who is a long time reader of Happy Quilting and a wonderful friend!!! 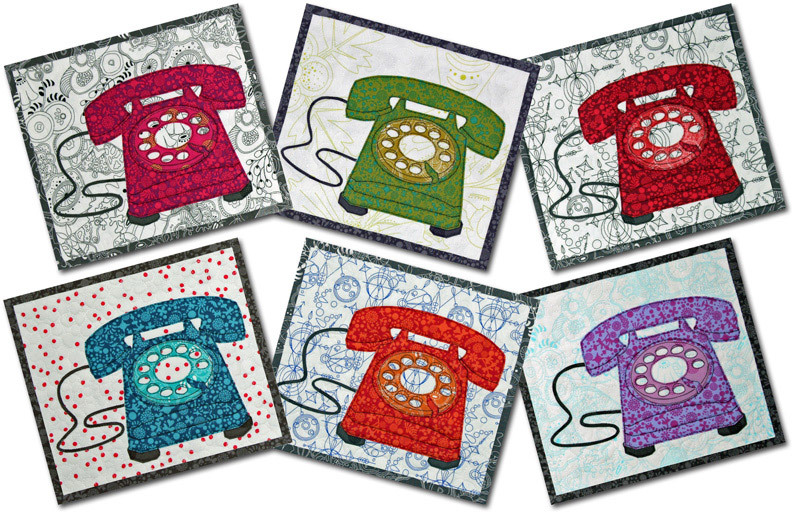 Crafted Applique is a new idea for applique that allows for no more fusible webs or glue sticks. The book explains all the ins and outs of Crafted Applique and has a great comparison breaking it down against other forms of applique. But the thing I really love is how great this method is for no-fray raw edge applique. Just look how perfect this hot pad from Lara's book is!!! As mentioned, the book goes through the whole Crafted Applique technique. When I flipped through the book, I totally knew I wanted to try Crafted Applique on this gorgeous project !!!! It is called Fork Art Christmas and I just love it!!! And what better project to try no-fray applique than with all of those gorgeously tiny curved pieces. So pretty!!! Oh, and if you happened to see Lara guest blogging at Sew Mama Sew yesterday as part of the tour, you would have seen these totally adorable Call Me Maybe Mug Rug Tutorials. So ya, those might have just been added to the list as well. I mean, how cute are those!!! So ya, I know have 2 projects added to the list and I can't wait to give this Crafted Applique a try!!! 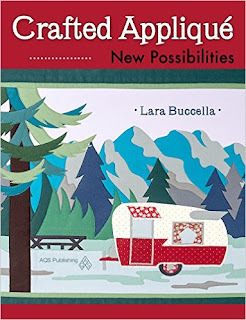 Be sure to pop on over to Lara's and check out all of the amazing stops on the Crafted Applique Blog Hop!!! There is a lot of amazing applique eye candy to be seen and of course more giveaways!! The giveaway will be open until Saturday the 14th and I will announce the winner at the end of the day. One entry per person please. Good Luck and Happy Quilting!! Love it but I only do basic applique. I think that an applique quilt will be on my todo list this year. I've not done much applique but I think it is so pretty. This book looks so awesome. Thanks for the giveaway! I like that I can applique by hand and machine. I have a vintage quilt that is very beat up. It is a hand appliqued Dresden Plate. I have it on the list of things to do which is to remove the feedsack Dresden Plates and applique them to a new background and hand quilt it like it was originally quilted. LOL Melissa , I'm only paying you back for the fact that you constantly add to my bucket list! It grew exponentially after I started reading Happy Quilting! Thank you for your wonderful book review! I'm glad you liked the Sew Mama Sew tutorial too! I hope you'll have a ball with Crafted Applique! I've done needle turn applique, but didn't enjoy it. It was just a means to get to the look I wanted. This technique is really intriguing, and might be just what I need. I love the look of applique but mine looks like the dog's dinner! Would love to see how this method works!!! I've done all methods of appliqué, but am intrigued by the idea of this one. Sign me up! I've never really tried but it is on my list to learn. I think applique gives the opportunity to create something that is realistic and really pops! I'm not very good at it! Love it, so portable, always have one project (you know I'm fibbing-more like 4 projects) going on at once. Made a 20 block Baltimore style quilt for mom and dads 50th! Yes...I love it! I am a novice as regards applique. I think I understand the basics, but the little I've tried has only been moderately successful. I'd love a chance to try this method out! Love applique but am definitely interested in this method! It sounds great! I love applique and I'm very interested to learn this new technique. Sounds like a great way to make more durable/washable applique items. I love applique! I would love to win Lara's book and try her method. Oh my goodness!! Have tried it once or twice but so far I HATE it! Maybe this book will make it easier! I love the look of applique and I'm okay with fusible web and machine applique but hand stitching is beyond me. I've tried a few times but just get frustrated. This book looks amazing!! I love hand appliqué. I have tried all the methods, but I like needle turn the best. Would love to see Lara's new method! Love very interesting. Lara's projects are all fabulous. I love those phones. I have always disliked the stray threads when using the fusible applique method so this technique is perfect. would love to try a new technique! Wow, if all those small pieces in the tree can be applied with Lara's method and have no fraying edges, I'm definitely 'in'! I'm so excited to learn the secret to her process. I love applique. Looking forward to learning a new technique. I have tried other ways, but hate it. I have done some raw edge applique and like it. I would love to win this book and hopefully learn her new easy way. Thanks for the giveaway! 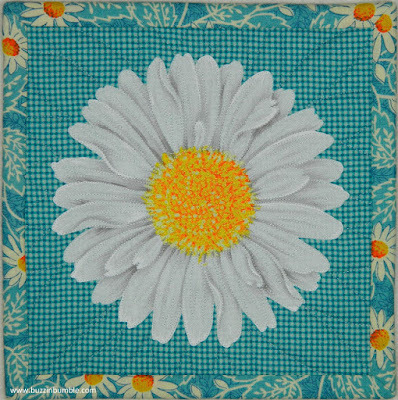 I've done a bit of applique in The Splendid Sampler blocks. I would like to master the technique and experiment more with it. I would like to try another method and I love the look of some of the designs in this new book. Bought the book! Easy to follow, great directions- recommend it! I would love to try this new technique! I love all the possibilities that applique work offers! I'm really interested in learning this technique. Maybe more appliqué is in my future. Love applique and I try all the techniques. Would love to try this one as well. I love appliqué. It is so much fun and looks so beautiful. Sooner or later, I want to try a Baltimore Album Quilt! The items in this book look like they would be fun to do! Thanks for the opportunity to win! I am trying all types of applique. 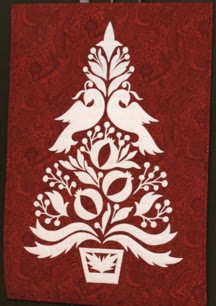 Have a Christmas quilt that has 4 blocks of needle turn applique I'm working on now. I do love using steam-a-seam light, (cutting out the middle), applying it and then using hand blanket/buttonhole (?) stitch around. I really like applique! I've made some cute choo choo train quilt with lots of applique for two of my grandsons. I'm interested in this new technique! Thanks for the review of this book. I have tried 3 applique projects with limited success. I am eager to get my hands on this book and hopefully learn a better method for my next project! Applique is beautiful. I have tried it years ago but need to attempt it again. The beautiful end result seems worth the effort! Love the cover quilt for this book. I really enjoy applique--all kinds: needle turn, fused, machine, hawaiian, wool. I really like applque, and am in awe of some of the amazing applique projects that I see. I have only done raw edge applique using a fusible web, and then buttonhole stitched around it, and I like the look, but the intricate designs are not suited to that. So to win this book would be so awesome because then I could learn how to the delicate appliques I see. I am just starting to explore applique. I have taught myself needle turn applique and love it! Next up is machine applique and I'm sure that I'm gonna love it too! Love the look of appliqué but haven't had much success at it. If there's a new , easier way...I'm all for it! This has to be the year that I start appliqueing since I have several BOMs and QALs that incorporate it. I have gotten as far as starting to make the applique pieces using the starch method, but I haven't done any attaching quite yet. Thanks to you and Lara for the giveaway opportunity! I've tried a couple different methods of applique. Used to hate it but now we are becoming friends (a new machine really helped). Can't wait to see her method. I love applique by machine. Not so much needle turn as I have yet to really get the hang of it. Always looking for new ways to applique. Fun book and projects. I have only done fusible applique by machine. Never tried needle turn or other methods. I tend to shy away but probably just need more experience. I love applique and do a lot of fusible raw edge, and all that zig zagging or blanket stitching drags on and on. Of course, I commented on her blog for a chance to win, and then seeing as how there was so many comments I figured I'd just buy it. Amazon wants to charge an "import fee" to mail the book to Canada. Sorry, this was a rip off! We DO NOT get nailed an import fee, or duty, or customs fees on small orders. Get up there over $100 and you take your chances these days, but on a $22 book? No way, yet Amazon is wanting to make an extra couple of dollars. I won't support that. I hope the book becomes available elsewhere to purchase! I have mixed feelings about applique. Sometimes I can get into it. But often I never end up finishing the project (especially when it's hand applique--I'm looking at you, Hawaiian quilt!) I think my favorite project was your Irish Chain Twist Quilt-a-Long; I liked how applique was a part of the process but not the whole thing. I am taking a class on applique, fusable with blanket stitch, and am open to new techniques, thanks. I don't like raw edge applique on bed quilts, but I use it on crazy quilt pieces that won't be washed. I've done enough needle turn to know it is not for me. I've done machine applique, and it is ok, not much fun. Wish there were another way. Love that folk art tree! Looks like a great book. Thanks for the giveaway! HI,LOVE IT! EAGER TO SEE THIS BOOK! THANKS FOR A WINNING CHANCE! Just learning applique and this looks interesting. Thank you for the opportunity. My favorite method of appliqué is raw edge...fast and easy! I'm learning to like applique and would love a new technique to help me out. Thanks for the opportunity to win. I love the look of good applique, but I don't think I do it that well-I do it by machine with a blanket stitch. I would love to learn of a better way to do it! I sometimes add applique to pieced quilts and I love that look. The technique I choose depends on the project and the size & shape of the applique. But I have avoided raw edge applique for things that need to be washable because I didn't want it to fray. From what I'm reading about Lara's technique, fraying is not an issue. So I say, bring it on! I think I need this book. I have done very little appliqué. Should do more. Love to do hand applique. Tried machine applique with satin stitch but the fusible did not stick in places. It was a mess. Only hand applique now, but would love to learn how to machine applique the right way, and have it still look good after a few washes. No fray applique is just what the doctor ordered, lol! Bring it on! I like to do appliqué, mostly by machine. Just dipping my toe into applique, but so far not a fan of fraying edges. This looks intriguing! I love to applique but am not skilled at it! I need more practice. I have only done a little applique. I don't like how stiff fusible makes the fabric so I would love to learn another method. I like soft, cuddly quilts! Love appliqué. Anxious to try this new method. I like appliqué!! I'm definitely interested in learning new techniques. I love the look of applique but I almost always have "issues" with it - so I am looking for a new way. This could be my answer. I like applique, but don't always have the patience or the time. Love that camper on the front cover, I'm likely to buy the book just for that pattern! It's an 'on occasion' type of block for me. Not my regular diet. Love it. Always looking for new techniques Keeping my fingers crossed. Ok, so I said Imwould never applique! It just looked and sounded hard. Of course, never say never, and I am a relatively new applique-er!! I love it and have a few projects lined up to start soon! This book sounds great!!! Mixed feelings on applique. Don't like how fusibles change "the hand" and my eyes are not good enough for needle turn version. However, I have used it for certain projects and will continue to do so. I haven't done much applique but I did take a class several years ago showing all the ways to applique. So, I would like to see another applique method! I do like applique, but now I'm looking for a new technique and that would be Lara's! I'm very anxious to learn her secret and everyone's being so very good about keeping it quiet! Applique really can be a lot of fun; I've done it with satin stitched edges, raw edge, and fused with blanket stitch around the edges ... all good. But it'd be so fun to learn another way and see all the fun projects in this new book! I'd love the chance to win! I love appliqué and think I'd love it even more using this technique! The last applique I did was the heart on the bust of my dress for my Queen of Hearts costume last year and I must say, it came out way better than any other applique I've ever done. I do declare I'm ready to give it another go. I love how versatile applique is: whether I want to do a quick project or an heirloom, there is an applique technique that suits the occasion. Definitly ready for a new way to do raw edge applique! I love the way it looks but I'm sure not good at it. Practice, practice practice as they say. I would love to try out this applique method, and the book would be a great assistance. I've been too nervous to try appliqué, but will do it some day! I've only done a little applique. I'm unsure really how to do it so haven't done much. This book and method sound like they would open doors for me! thanks for the chance. I have never been satisfied with my results. I am anxious to try this new method. Thanks for the chance to win. I love the look of applique but rarely do it. Love the look of this--I think I'll need to try it! I've never been completely happy with the way my applique has turned out but would love to give it another chance with this new method. Up until a few years ago, it was all about applique on little baby quilts. Then I discovered blocks - never realized the joy this would bring. Now it is hard to go back to applique - I will have to combine the two. Thank you for this giveaway chance :)! I've tried every method and currently do mostly machine applique. I just love the look and have some ideas in my head that I would love to make. Can't wait to see this new technique. I don't do much applique, but l enjoy the hand work and have dabbled in machine techniques. I'm always up for new ways to do things! Thanks! I'm intrigued by this new method that I can't imagine. I currently just use fusible methods. I have tried needle turn and it's not for me. Hope I win! I like the look not so much the process. I do not have much experience doing applique but I would like to explore more. I'm enjoying the fact that most of your are sharing different aspects of the book. It has been an insightful Hop. I'm buying the book if I don't win it and have found a couple new blogging friends. I'm fairly new to applique and still iffy on whether I like it or not. I love machine applique, never tried hand applique-and no real interest in trying it. Rookie applique-er here! Tried one side fusible thus far, like that process, machine appliqued around it...so so fun! Thank you. Applique is fantastic! I have always enjoyed Satin Stitched appliques, but trying new ways to do applique are fun and exciting to try! After looking around her blog, I am very impressed and would love to own a copy of this book! Thank you for the opportunity! Have a fantastic creative day! Love the look of appliqué, but never very satisfied with my attempts! I am always excited to find a new method! I have machine appliqued for decades, but now I am trying to expand my techniques. I haven't tried it yet, would like to though. Appliqué looks beautiful but I haven't tried it yet. I'm interested in how she does this appliqué wo fusible or glue stick. I'll have to check this book out. I love to applique and use fusible web. I am very interested in learning a new method and thank you for the opportunity to win Lara's book. I am not very good at it and would ove to learn a new method. I will check out the book!! I like it, but need LOTS more practice! I like doing machine applique and would really like to learn some new techniques. For me it is baby stitches. As long as I am patient and use baby stitches my applique seems to turn out nicely. I've tried all the techniques and while I like the finished look of needle turned work, most of my work is raw edge, machine applique. Interested in seeing this technique. I'm new to the applique world and would love to try this method. I'm afraid of needle turn appliqué; have done machine raw edge and don't mind it, but I tend to avoid appliqué in general. Curious though about this new technique. Oh, I hope I'm not too late to participate! I enjoy machine applique and I'm getting much better with it after workshops with Pat Sloan and Robbi Eklow. New techniques are always welcome! Applique was the only thing I did when I first started to quilt, I hated piecing. Now I enjoy piecing and haven't appliqued in a while. I'm ready to try a new method and get back into it. this book looks great. I love applique and am most interested in learning Lara's new technique. I am lazy and like to do it on the sewing machine, raw edge style. I have done lots of starch turned as well. I've done machine applique and needle-turn, and even though using the machine is faster, I like the look of the needle-turn much better. I'm always interested in learning new ways to do things, so this book would be absolutely the best! Thanks for the opportunity to win!! I love applique in every way: So I have to try this one out too. Often I struggle with small pieces. Love all methods of Applique. Dying to know what her method is. I love applique , especially machine appliqe with turned under edges.